5 January - Well I'm getting around to doing it at last - the Pond Diary re-opens! 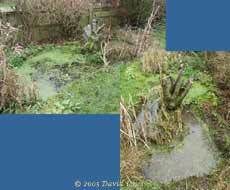 As I noted in the garden diary, I have been spending short periods clearing some of the old vegetation from the big pond ready for this Spring's influx of frogs and newts. These two images show the state of the big pond today. For those of you new to my ponds, there are two. This one is the largest, and measures about 12x5ft. The left hand (Eastern) end is the main, deeper part while the other (Western) end is the shallow area favoured by the frogs for spawning. You can see this part in the right-hand image. This needed quite drastic clearing - I should have taken before/after pictures! The log in the middle is a useful perch for birds, and solitary wasps burrow into it to lay their eggs. Although I have already removed quite a bit of Duckweed already, I'm hoping for some heavy rain in the next few days so that the pond is filled to its maximum level. This will make it easier to skim off more of the weed without getting the net snagged on the plants growing below the surface. I also need to do some clearing in the area between the ponds. 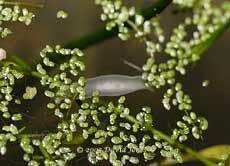 I didn't take any photographs of them, but as usual in the Winter, I came across several small 'newtlets', complete with external gills as I removed weed from the pond. I've no doubt that I shall see more of them as the adults appear in the Spring. This is the small pond today. This one is left alone as much as possible. 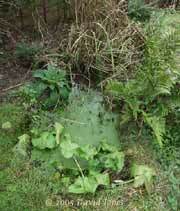 While newts lay eggs in it the frogs never do, although they do spend a lot of time in it. While I have neglected the pond over the last 6 months or so, I have been looking into it every so often, and I think there have been fewer frogs in it so far this Winter. 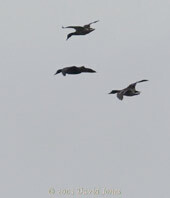 Over the last few days I have been able to see up to five in the open around the sides of the pond. 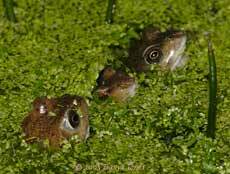 Here, two look out over a duckweed covered bank. Are they waiting for food to appear, or to greet the visitors that will soon start arriving? 6 January - The rain hasn't appeared today so the duckweed waits, and spreads to fill the gaps. Last night I could count ten frogs around the edges of the big pond, although four of them were youngsters and will not be breeding this Spring. Tonight I can see just four, including this, perhaps just about mature adult. This morning I received the UK Phrenology Network report about last year. It shows the average first sighting of frogspawn was 6 March, so we have two months to go of that is repeated this year. I would expect to see the frog numbers start to climb in the last week of January. With the new camera available I hope to start taking some decent pictures of the smaller pond inhabitants that are active during these winter months. In the meantime, here is a snap of a flatworm that was meandering inverted under the water's surface tonight. 18 January - There is nothing really new to report since the last diary entry. I have seen no more than 5 or 6 frogs each night. Tonight a couple were out on the bank as I approached, but jumped in as soon as the torch was pointed their way. One of the two was a very small one, no more than 1 or two years old. 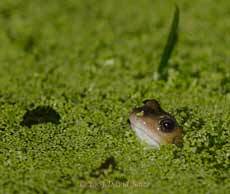 The duckweed seems to give a frog great camouflage as it peers out into the darkness. However, the light colour of a frog's underside shows up quite clearly, at least in torch light or by the flash of the camera. 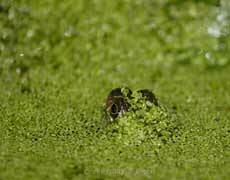 The clear spot in the duckweed, to the left of the frog, marks a spot where a frog surfaced earlier. 20 January - One of the two Reedmace seed heads in the big pond is starting to give up its seeds. I would have expected to see the seed mass starting to bulge as this happens, so I'm not sure whether it is is happening naturally or if it has been prompted by the attention of a bird. A good few of the seeds have fallen to the pond surface where they are floating in rafts, as shown in the lower image. Not really a garden pond picture, but I thought I'd include this shot here. We often see Mallard Ducks coming and going to the Brickfields Park pond, but I am rarely equipped with my camera when they pass over us. This trio were really a long way 'up the street' but it's the first time I caught any image of them. They are approaching the pond against the strong, gusty wind that has been blowing all day. 26 January - The last three days have been cold enough for a thin layer of ice to form over most of the big pond, although there are still areas of open water, maintained by the bathing of the Blackbirds, Sparrows and Starlings. 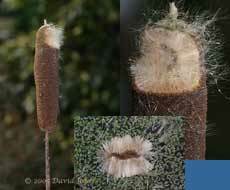 The reedmace pictured above is continuing to shed seeds in the breeze. 30 January - Just a short note to record that last night I saw the first pair of frogs in a gentle 'cuddle'. It's still too early for the passionate embrace of amplexus that will signal the start of spawning, but it is a signal that the pond will soon become a busy place. I hoped to get a photograph but I touched a plant stem as I moved the camera into place and that was warning enough to cause the pair to retreat under the water. Including those two, I could see ten frogs in the pond when I looked at 11pm. 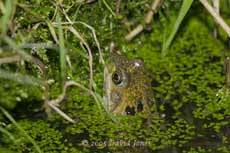 31 March - Despite mild conditions, last night I could only see a couple of frogs in the ponds -surprisingly quiet.